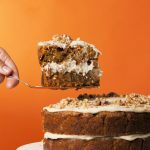 We’re super proud of this carrot cake. It’s absolutely epic, it’s sweet and it’s entirely vegan! Say what? The cake is inspired by a recipe in the Meat Free Monday cookbook. If you don’t know about Meat Free Monday, go check them out. 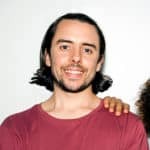 They’re a charity run by Paul McCartney and his family, and they do great work encouraging people to cut down the amount of meat they consume. We’re big believers in encouraging people to make small steps to a vegan diet, and these guys are a massive part of that. And in case you missed it, our debut cookbook So Vegan in 5 is available to pre-order right now! You’ll find over 100 super simple 5-ingredient recipes, making it easier than ever before to cook delicious plant-based meals at home. You can find out more about the cookbook here. Thanks as always for the support! Preheat the oven to 180°C fan and line 2 x 20cm cake tins with baking paper, then grease the baking paper with dairy-free margarine. Make the flax eggs by adding the flaxseed to a small bowl along with 9 tbsp of water. Stir to combine and set to one side. Transfer the walnuts to a small baking tray and place in the oven for 5 minutes until nicely toasted. Reserve a handful of walnuts for decoration and roughly chop the rest, then leave them to cool slightly. Sift together the flour, baking powder, bicarbonate of soda and ground cinnamon. In another bowl, whisk together the flax eggs, sunflower oil, golden caster sugar and vanilla extract until smooth. Add the chopped walnuts, grated carrot, raisins, desiccated coconut, the zest of the orange and the orange juice, and mix until thoroughly combined. Stir in the sifted dry ingredients until smooth and divide the batter evenly between the two prepared cake tins. Bake in the preheated oven for 40 – 45 minutes or until a toothpick comes out clean when inserted into the middle of the cakes. Remove the cakes from the oven and leave them to cool in the tins for 3-4 minutes, then turn out onto a wire cooling rack and rest until completely cool. Meanwhile, prepare the cashews frosting by transferring the cashews to a bowl and soak them in hot water straight from the kettle for 20 minutes. Drain and rinse the cashews, then add them to a blender or food processor along with the vanilla extract, maple syrup, lemon and milk. Process until smooth, scraping down the sides as needed. Place 1 of the cake layers on a serving plate and spread with half of the cashews frosting. Top with the second cake and cover the top with the remaining cashew frosting. Decorate with the reserved toasted walnuts. Serve immediately or keep in an airtight container in the fridge for 3-4 days. Not great, far too greasy. I thought when I looked at the recipe that it is a lot of oil and no plant milk mmmmm. But I went with it, what a waste of good ingredients. Hey Patricia, you can try substituting some of the oil for plant milk, but we haven’t tested this. 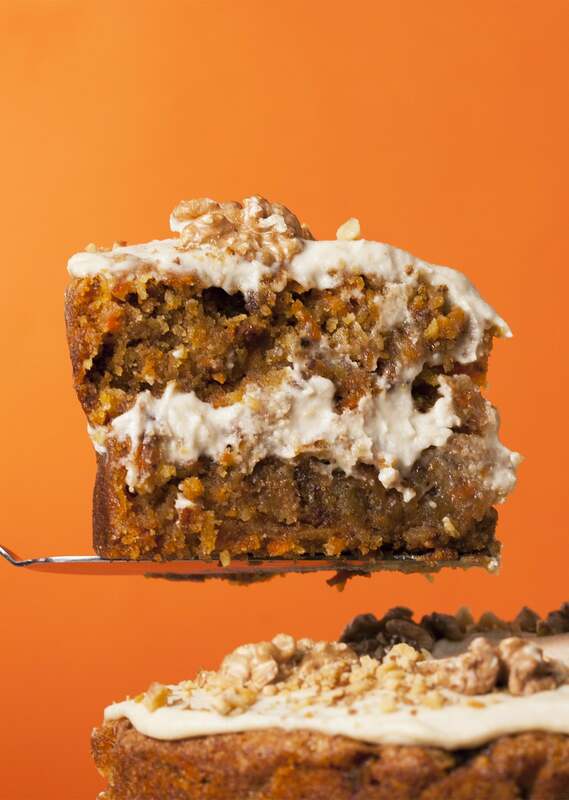 We prefer our carrot cakes moist it works for us, but we definitely encourage people to try their own twists! Let us know how it turns out. yep lots of oil. 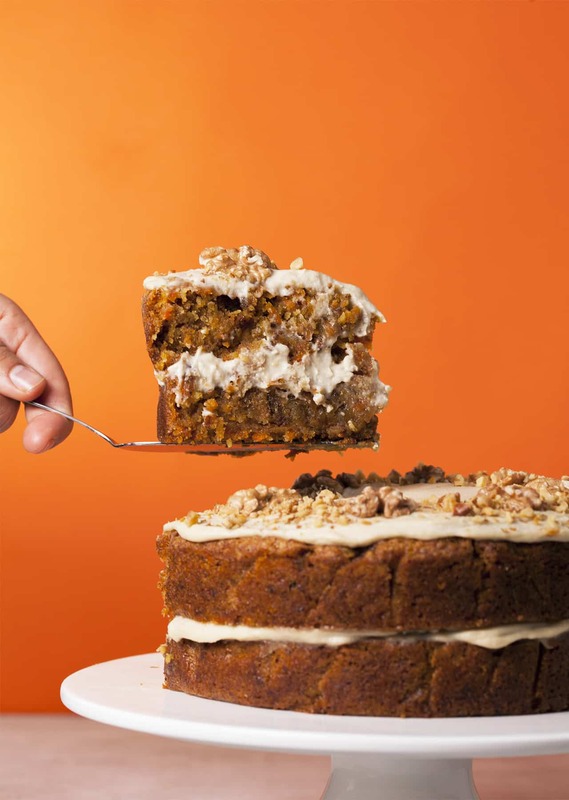 But ……the best carrot cake ever, really. I own a bakery shop an so I bake a lot! 🙂 but this carrot cake ….mmmmmm thank you! I must admit that I agree with Patricia, next I try to bake it with less oil and instead some plant-milk, I also used 100g less sugar.